Sudipta Seal will receive the prestigious Materials Research Society Fellow award in April and the the Lee Hsun Lecture award from the Chinese Academy of Sciences’ Institute of Metal Research in June. Sudipta Seal is a Pegasus Professor, trustee chair and is affiliated with UCF’s Advanced Materials Processing Analysis Center and Nanoscience Technology Center, in addition to his role as chair and professor in the College of Engineering and Computer Science’s Department of Materials Science and Engineering. 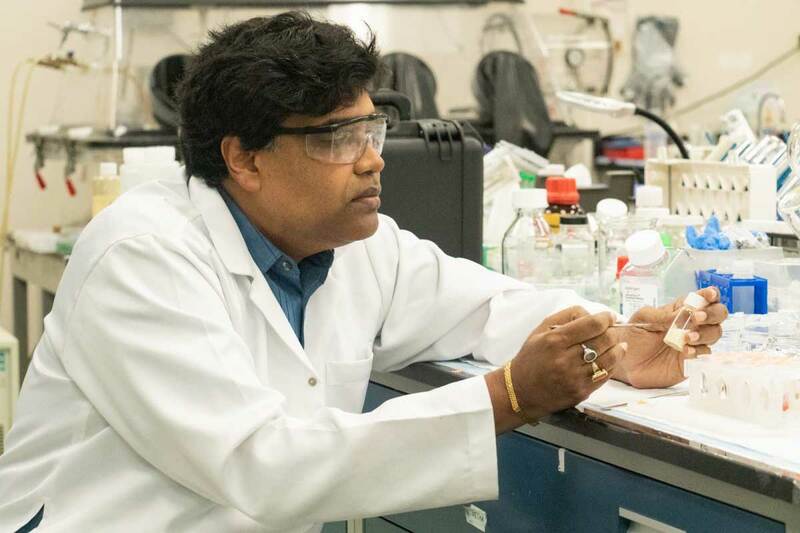 Sudipta Seal, an engineering professor and chair of UCF’s Department of Materials Science and Engineering, will receive two international awards in the coming months for his contributions to materials science research. He will receive the prestigious Materials Research Society Fellow award at the end of April during the society’s spring meeting. Seal will be the first at UCF to receive this award. With his designation as an MRS Fellow, Seal joins the ranks of other top researchers in his field from around the world and the United States, including seven from the University of Florida, one from Florida State University and one from Florida International University. The award recognizes outstanding contributions to the materials science field by individuals who exemplify the highest ideals of accomplishment, research, leadership and service. In June, he will travel to China to give a series of lectures and receive the Lee Hsun Lecture award from the Chinese Academy of Sciences’ Institute of Metal Research. The award honors scientists who have made significant contributions to the field of material science both in the scientist’s country and abroad. Seal’s work blends engineering, materials science and nanotechnology for applications in medicine, space and the environment. These accomplishments have included creating unique nanoscale cerium oxide molecules, leading to the discovery of their antioxidant properties and applications in medicine, as well as using nanotechnology to turn a waste byproduct from coal power plants into a material to clean up oil spills and developing nano-energetics for propulsion. Seal has a doctorate in materials engineering with a minor in biochemistry from the University of Wisconsin and was a postdoctoral fellow at the Lawrence Berkeley National Laboratory, University of California Berkeley. He has a master of science degree from the University of Sheffield and a bachelor of technology degree from the Indian Institute of Technology in Kharagpur. He is a Pegasus Professor, trustee chair and is affiliated with UCF’s Advanced Materials Processing Analysis Center and Nanoscience Technology Center, in addition to his role as chair and professor in the College of Engineering and Computer Science’s Department of Materials Science and Engineering. He is also a member of UCF’s Prosthetic Interfaces cluster and holds a joint appointment in UCF’s College of Medicine. He joined UCF in 1997.